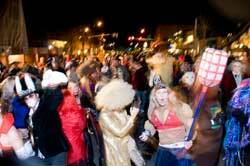 Express file photos Crowds fill the street in Ketchum on Halloween last year. This year, less emphasis is being placed on the street party, but plenty of spooky events are still on the docket. This might be a good Halloween to dress up as a four-eyed, nutty professor complete with athletic tape on the glasses. We're in for a long haul. Since Halloween is on Sunday and events are happening all over the Wood River Valley, accessorizing with a pocket protector, some pencils and a flow chart may make the nerd the most popular member of a Halloween crew—so the group doesn't miss anything. Students at Hemingway Elementary School are having a costume parade on Friday, Oct. 29, at 8:15 a.m. sharp, which is perhaps the unofficial start to Halloween in Ketchum this year, since the dissolution of the Sun Valley-Ketchum Chamber & Visitors Bureau meant the end of any citywide planning for Halloween. Nonetheless, it's going to be pretty scary in the Wood River Valley for a few days following the Friday morning elementary school parade. Complete with a spook alley, arts and crafts and candy galore, the Ketchum Parks Department will host a free Halloween party open to the public in Atkinson Park from 1-3 p.m. on Sunday. Volunteers are welcome to come help set up on Saturday. Between the events geared toward children, festivities, especially for adults, are nonstop. It's not all about the nightlife this Halloween. On Saturday, Oct. 30, morning, those participating in the first Trail Creek 12k Trail Run (sunvalleyrunning.com) are invited to wear costumes. Bib pickup for the 10 a.m. run begins in the upper lawn area of Trail Creek Cabin in Sun Valley at 8:30 a.m.
On Saturday night, Ketchum is still shutting down a block of Main Street between Second Avenue and Sun Valley Road. Though there is no showing of the Rocky Horror Picture Show at the nexStage Theatre this year, the Main Street bars are hosting costume competitions and loads of music. "I'm going to be a pirate," said Sawtooth Club bartender Dale Byington last week while busy mixing drinks. "We're going to have a nurse and a doctor, and one of the servers is going to dress up as a Buck Hunter (video game) girl." Across the street at 11 p.m., the Roosevelt Grille is hosting a costume contest that starts upstairs, where the deck will be open. People can warm up by the fire pits. One at a time in each category, including scariest, sexiest and best group costume, contestants—competing for prizes and gift certificates—will descend the stairs into the main-floor dining room for a pirouette on the landing to the cheers and jeers of the other ghouls and goblins, said restaurant owner Tom Nickel. Nickel said local band Hoodwink will hit the stage at 9:45 p.m. with its brand of classic rock 'n' roll cover songs from the 1970s to the 1990s, and original compositions. "We can blow the roof off the place," Nickel said. Off of Main Street, there will be action for those who venture to Sun Valley or Apple's Bar and Grill in Warm Springs for an attitude adjustment during the long "Halloween Weekend," as the bartenders at Whiskey Jacques' are apt to put it. Whiskey's will have live music and disk jockeys until Halloween night on Sunday, starting with three bands on Thursday. Its Halloween Bash on Saturday will feature Old Man Markley. The Hailey Halloween Hoopla, sponsored by Cox Communications and Zions Bank, is happening on Friday, beginning with trick-or-treating from 3-7 p.m. at businesses marked with black and orange balloons. There will be lots of fun for kids and families. Because the weekend is so jammed with events, it's a year to try out more than one costume for those who are having difficulty deciding between a more traditional costume (witch, ghost or Frankenstein) and something more creative (Velcro Woman or Middle-Aged Guy With an Enormous Beer Belly). Why not do both this Halloween weekend? It's that special season (some call it an international holiday) when humans can behave as something other than themselves. "I'm thinking about being a cop," said Anna Svidgal at the Hailey Chamber of Commerce. "Because I think it looks good on me." Another popular event will be the Bellevue Haunted Forest at the Howard Preserve, where tickets are expected to sell out for visitors on Friday and Saturday evening. "The gates open at 5:30," said Tammy Eaton, one of the event organizers. "It's a surprise. I could tell you, but I'd have to kill you and use you as one of my props." The forest will stay haunted until 9:15 p.m. The event website (bellevuehauntedforest.com) states, "Before dark have a little scare. After dark bring your Pampers. After dark is not for children or adults who scare easily." It is enough to send shivers through the steeliest character. "It's exceptional," said Mahoney's Bar and Grill owner Sean Mahoney, who turned a little pale thinking about the fright he has had in previous years in the Haunted Forest. Mahoney's is hosting a family-style Halloween Party on Saturday with costume prizes and apple bobbing, but he said people should stop by the BrickHouse restaurant, where the party continues and the frightened can recover from the scare. "I mean at night (not just Halloween), it's scary. It's so dark (in the Howard Preserve)—and the animals." Primed with fear, escape from terror in Bellevue may require soothing riffs of live music at the Silver Dollar Saloon or a bus ride to Ketchum for yet another costume contest at the Cornerstone Bar and Grill in the historic brick building on Main Street that still houses a few ghosts of the 1880s Lewis Lemon General Store. The bar will award prizes after 11 p.m. for categories such as "Best Use of Foam Rubber," "Most Duct Tape," "Least Expensive" and "Best Whacked-Out Celebrity," said Megan Vorn, the proprietor. DJ Tipsy Hegewald from New York City will be spinning. "Christmas and Hanukkah are really nice—Halloween is for the true believers," Vorn said.